[S325] Lucius M. Boltwood, Thomas Noble, Page 402. [S325] Lucius M. Boltwood, Thomas Noble, Page 384. [S325] Lucius M. Boltwood, Thomas Noble, Page 385. Christian Cadwell was born at Hartford, Hartford Co., CT. She married Rev. Gideon Noble, son of Ens. Matthew Noble and Joanna Stebbins, on 4 December 1760.1 Christian Cadwell died on 24 November 1809 at Willington, CT; according to the family record. [S325] Lucius M. Boltwood, Thomas Noble, Page 196. Eliza Ann Holcombe was born circa 1825 at Dresden, Washington Co., NY.1 She was the daughter of James Holcombe and Olive Noble. Eliza Ann Holcombe married Charles Noble, son of Charles Noble and Ann Waters, in 1848.2 Eliza Ann Holcombe married Edward Mackin. [S325] Lucius M. Boltwood, Thomas Noble, Page 554. Esther Holcombe was born on 17 September 1830 at Granville, Washington Co., NY.1 She was the daughter of James Holcombe and Olive Noble. Esther Holcombe married Lewis Fowler on 10 January 1851.1 Esther Holcombe died on 11 December 1886 at Lamoni, Decatur Co., IA, at age 56.1 She was buried at Rose Hill Cemetery, Lamoni, Decatur Co., IA. Lewis and Esther were enumerated in the 1870 Amboy, Lee Co., IL, federal census. He was a farmer, age 43, she was 39. Children in he household were Olive 18, Eda 15, Lewis 14, George 11, Harriet 9, Esther 5, and Joanna 2. Lewis and Esther were enumerated in the 1880 Fayette, Decatur Co., IA, federal census. He was a farmer age 56, she was 50. Children in the household were Eva 25, George 21, Esther 15, Laura 8, Alma 7, and Edmund 3. Information from Sheila Smith of Clinton, IA, provides details of this family, but, as yet, verification of the link to parents James and Olive is pending. Based on the frequently unreliable information from census records it appears that Henry and Louisa each had a child prior to their marriage and then produced four children of their own. The census records of 1910 indicate that they were married circa 1867, which would be after the births of Charles and Frances. Henry was enumerated in the 1860 Amboy, Lee Co., IL, federal census, age 25, single, born in NY. Henry and Louisa were enumerated in the 1870 Amboy, Lee Co., IL, federal census. He was a farmer, age 35, born in NY; she was 27, born in WI. Two children were enumerated Emma 3, and Melissa 1, both born in IL. Also enumerated was Francis Snodgrass, 9. 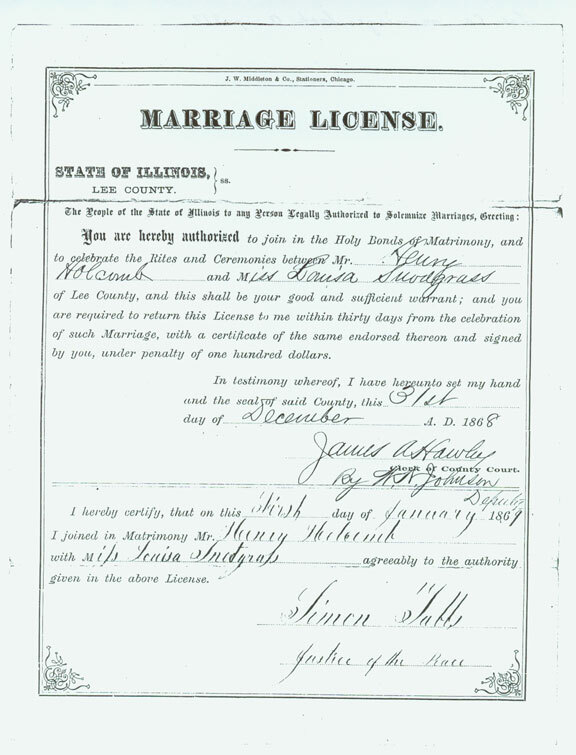 Henry and Louise were enumerated in the 1880 Amboy, Lee Co., IL, federal census. He was a farmer age 45, she was 36. Children in the household were Emma 13, Mary 10, Julia 8, Isabel 7. Uncle Stephen Sherwood was also in the household, age 65. Henry and Louisa were enumerated in the 1900 Amboy Twp., Lee Co., IL, federal census, next door to nephew Linus Holcomb. Henry was born in NY in Dec 1834, and wife Louisa in Feb 1844. There were no children enumerated, but Louisa had 5 children, all still living. Henry was enumerated in the 1910 Amboy Twp., Lee Co., IL, federal census. He was 75; wife Louisa was 65. Henry had been married twice, they had been married 42 years. Louise had 5 children, 4 of whom were still living. Henry Holcomb, or better known by the children and many friends of this city, as Grandpa Holcomb, passed away at 11:13 o'clock Monday morning at the home of his daughter, Mrs. Perry Hastings, 607 East Sixth Street. His demise was due to dropsy of which he has been a sufferer for several years. Mr. Holcomb was born Dec. 15, 1834 in White Hall, New York. In the year 1864 he moved to Amboy, Ill., where he was engaged in farming for a number of years. For the past few years he has made his home with his daughter, Mrs. Hastings. He lease to mourn hi sdeath four daughers, Mrs. Emma Holden, Mrs. Julia Langford of Walnut, Mrs. Dolly Hastings, Mrs. Belle Wellman of Rock Falls, and one son, Charles Holcomb, preceeded him to the Great Beyond five years ago. The funeral services will be held Wednesday afternoon at 2 o'clock at the home of Mrs. Hastings. Charles Noble was born on 20 December 1823.1 He was the son of Charles Noble and Ann Waters.2 Charles Noble married Eliza Ann Holcombe, daughter of James Holcombe and Olive Noble, in 1848.1 Charles Noble died on 26 March 1880 at Amboy, Lee Co., IL, at age 56. Ann Waters married Charles Noble, son of Joel Noble and Naomi Loomis, on 13 February 1820.1 Ann Waters died at Whitehall, Washington Co., NY. Levi Holcomb was enumerated in the 1860 Whitehall, Washington Co., NY, federal census. He was one page and 12 households from Linus Noble Holcomb. It will be assumed that he is the brother of Linus and the family found in that census will be listed here. This Levi had children named Linus and Esther, the same as his siblings. Levi and Jane were enumerated in the 1850 Whitehall, Washington Co., NY, federal census, stamped page 55. He was a farmer, age 37, she was 32. children in the household were Levi 10, James 9, John 8, Celia J. 5, Linus 4, Olive 2, and Esther 7 months. Levi and Jane were enumerated in the 1860 Whitehall, Washington Co., NY, federal census. page 25, household 202. He was a farmer age 46, she was 42. Children in the household were Levi 20, James W. 19, Charles J. 18, Sarah J. 15, Linus 13, Esther 11, twins Lewis and Lucy 9, Aaron 6, Cynthia A. 4, Oliver 2, and Mary J. 6 months; all born in NY. Levi and Jane were enumerated in the 1870 Whitehall, Washington Co., NY, federal census. He was a farmer, age 56, she was 52. Children in the household were Henry 16, Oliver 12, and Julia 10. Levi was enumerated in the 1880 Whitehall, Washington Co., NY, federal census. He was a farmer, age 66, widowed, living in the household of Nathan James Beckwith. The 1855 Whitehall, Washington Co., NY State census shows Linus and Esther in the household of Andijohn Gillett. Theodocia is 4, Andijohn is 1. There is a possibility of another child, an earlier Linus N. Holcombe Jr. who was born 9 March 1856; who must have died before the like named brother born in 1865. Linus and Lucinda were enumerated in the 1860 Whitehall, Washington Co., NY federal census, page 24, household 190. He was a carpenter age 56, she was 55. Children in the household were Thedocia 7, Theodore 6, and Esther, 1. The census indicates that Lucinda and the three children were all born in Canada. Linus and Julia were enumerated in the 1880 Amboy, Lee Co., IL, federal census. He was a farmer, age 57, born in NY; she was 37. Children in the household were Mary 18, Linus 15, Otis 8 born in IL, Georgiana 7, Laura 6, and Alice 2. It appears that there is an entry in the 1850 Whitehall, Washington Co., NY, federal census that is this family. Iona S. Holcomb, age 33, a carpenter, wife Sarah A., age 27, children S. E. (female) age 3, Olive age 1. Daniel Noble, a peddler age 32 is also in the household. J. (or I.) S. and Sarah were enumerated in the 1860 Dresden, Washington Co., NY, federal census, page 149. He was a carpenter, age 41, she was 36. Children in the household were Sophronia E., age 12, Alice S. age 11, William age 5, and Charles, age 2. Champlain and Sarah A were enumerated in the 1870 Dresden, Washington Co., NY, federal census, page 14. He was a farmer, age 51, she was 46. Children in the household were Sophronia, 23, William 15, Charles 11, Charlotte 9, and Isaac 7. Champlain and Sarah were enumerated in the 1880 Dresden, Washington Co., NY, federal census, ED 131, page 13. He was a farmer age 61, she was 65. Children in the household were Charlotte 19, and Isaac 17. [S389] Lawrence William Holcomb, "Holcombe, Champlin." Philoman and Cordellia were enumerated in the 1850 Granville, Washington Co., NY, federal census, stamped page 330, dwelling 1753, household 1900. He was a farmer age 37, she was 29. Children in the household were Mary 10, William 7, and a son 5. P. and Cordelia were enumerated in the 1860 Dresden, Washington Co., NY, federal census. He was a farmer age 48, she was 37. There were no children enumerated in the household. Cordelia was enumerated in the 1880 Whitehall, Washington Co., NY, federal census in the household of Munroe Chadwick. She was married age 56, but no husband was enumerated. [S59] Ruth Cost Duncan, John Case, Page 43. [S325] Lucius M. Boltwood, Thomas Noble, Page 260. [S325] Lucius M. Boltwood, Thomas Noble, Page 200. [S325] Lucius M. Boltwood, Thomas Noble, Page 193. [S325] Lucius M. Boltwood, Thomas Noble, Page 27. [S325] Lucius M. Boltwood, Thomas Noble, Page 34. [S325] Lucius M. Boltwood, Thomas Noble, Page 35. [S325] Lucius M. Boltwood, Thomas Noble, Page 28. [S325] Lucius M. Boltwood, Thomas Noble, Page 36. [S325] Lucius M. Boltwood, Thomas Noble, Page 39. [S325] Lucius M. Boltwood, Thomas Noble, Page 40. [S325] Lucius M. Boltwood, Thomas Noble, Page 41. [S325] Lucius M. Boltwood, Thomas Noble, Pages 27, 188. [S325] Lucius M. Boltwood, Thomas Noble, Page 188. [S325] Lucius M. Boltwood, Thomas Noble, Pages 27, 704. [S325] Lucius M. Boltwood, Thomas Noble, Page 704. [S325] Lucius M. Boltwood, Thomas Noble, Pages 27, 705. [S137] Elisha Scott Loomis, Joseph Loomis, Page 153. [S325] Lucius M. Boltwood, Thomas Noble, Page 705. [S137] Elisha Scott Loomis, Joseph Loomis, Page 140. [S325] Lucius M. Boltwood, Thomas Noble, Page 655.